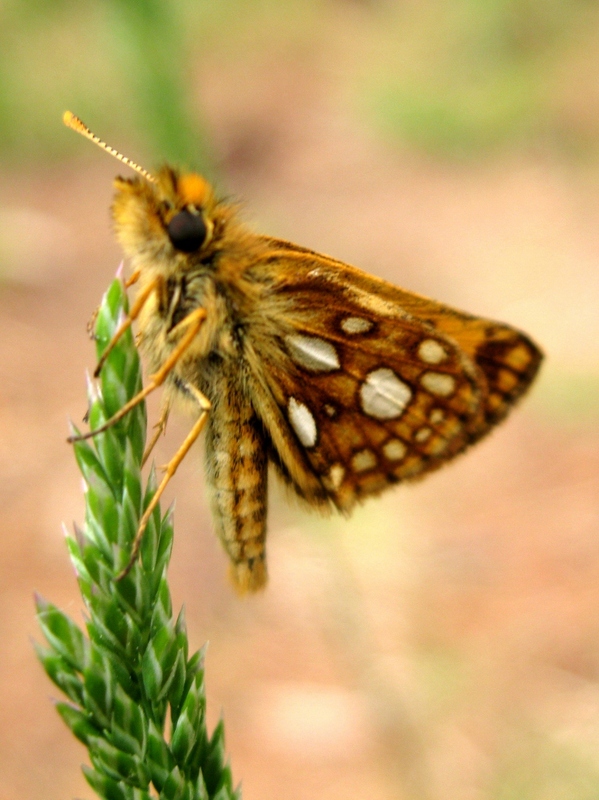 As you could guess from the American name, Arctic Skippers are mostly found in northern latitudes – in the U.S. you’ll have the best luck finding it in New England, here in the upper Great Lakes region, and in the Northwest. They spend the harsh winters of their range as caterpillars, rolling blades of grass together to make hibernacula (yet another great word!). Another butterfly ID tip: no rule like this is 100%, but typically a butterfly species has a strong preference for whether it rests with its wings open (like last week’s duskywing) or wings closed (like this one). A good field guide will point this out. Even if the colors weren’t so different, the posture alone would have clued me into the fact that these are two different skipper species. A good field guide (why do i always mistype it as felid guide?) will also have pics of the butterflies in their natural state, not dead, pinned, and wings spread in a manner not found in the field like in Seabrooke Leckie and David Beadle’s new Moth guide, and very much unlike my worthless guide to Missouri butterflies and moths. at least in my opinion. Absolutely. I haven’t seen the new moth guide yet but I’ve heard about it. Half the photos I see of pinned moths and butterflies are just totally unrecognizable. I love to go through the willow leaves checking for larvae in leaf rolls, galls, and leaf mines. Wonder if they use willow as a host plant? Very nice. Skippers are a challenge.